"Wishes" career started in his puppy year and his first open was the qualifying round of that year�s English Derby. In the first round he beat leading fancy Game Ball in 29,48 for White City�s 500 meters. The youngster cramped next time out and was eliminated. He then contested the Scurry and although extremely impressive when winning early rounds in 29,94 and 29,95 for Slought�s 434 meters. he was eliminated in the semis. He duly landed the consolation by just under eight lengths in 29,86. Yankee Express, in the fastest of his three Scurry wins, clocked 29,94 in the final. A week later "Whisper" beat Yankee Express in the 1983 Select Stakes. His time for Wembley�s 490 meters was 29,30. 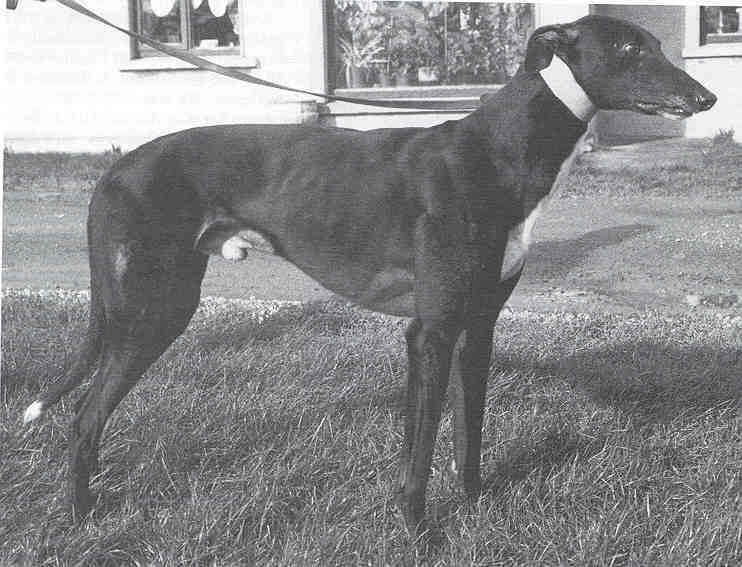 "Whishes" joined Carlie Coyle in the winter of 83/84 and was beaten in his first two races for his new handler. The second of them was in the qualifying round of the 84 English Derby where he led but was picked up by Amazing Man. He won his first round heat in 29,56, and came form mid division to beat the powerful Count five in 29,38 in the second round. "Wishes" then landed his quater final in 29,32 with an excellent exhibition of early pace that included a 2,98 split. Drawn trap three in his semi he again produced a faultless trap to line performance to beat House Of Hope by a length in 29,3. A7-4 favourite in the final, he beat Morans Beef by three quarters of a length in 29,43 - the first greyhound for 25 years to win an English Derby at his second attempt. He was then retired to stud. No dog in recent history has made it to the top as quick as "Whisper". This was due to both ability, and being on of the first top class Sand Man offspring to be retired to stud. He first became the number one NGRC open race sire in 1989 aged eight and retained the title in 1990 and 1991. He is the most successful son of Sandman and his offspring have similar versatility.